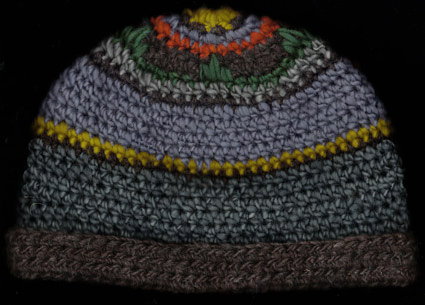 This is a medium bulky weight, thick spun hat that fully covers the ears. It's all wool. The dark brown is undyed Romney wool. The rest is Corriedale wool. The brim may be worn turned up or down. There's another thin green stripe separating the gray and dark brown that can be seen when the brim is turned down. Nice cap for either gender.